· Water security theory and methods, tools and audits. 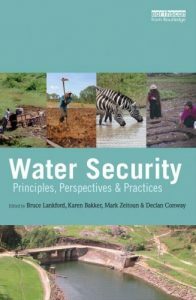 The book is loosely based on a masters level degree plus a short professional course on water security both given at the University of East Anglia, delivered by international authorities on their subjects. It should serve as an introductory textbook as well as be of value to professionals, NGOs, and policy-makers.